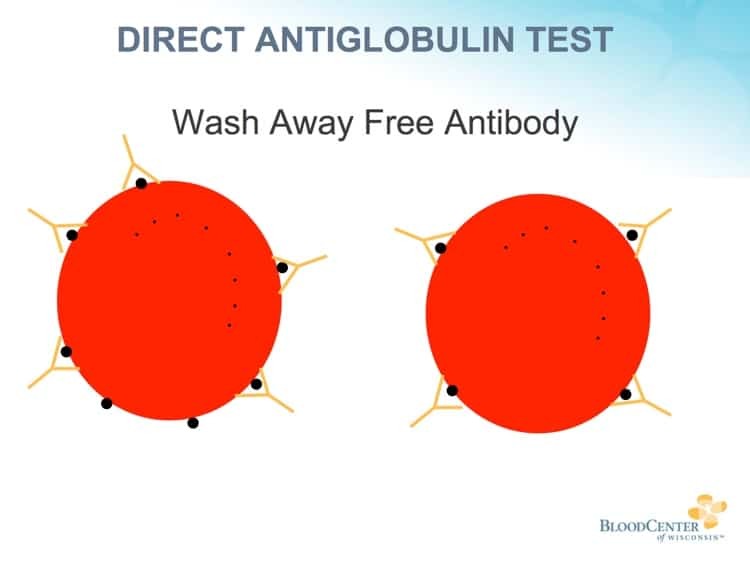 The Direct Antiglobulin Test seems super-simple, but there’s more to it than meets the eye! Sue Johnson joins Dr. Chaffin to discuss. The DAT (also known as the “Direct Coombs” test) is really a basic and easy test to do. For such a simple test, however, most blood bank students struggle with the concepts, as do many clinicians! The DAT leads to discussions of autoantibodies, adsorptions, and elutions, oh my! Never fear, though, my friend Sue Johnson is a master teacher who has explained the essentials of the DAT to thousands of students! She is my guest on this episode to guide us to great clarity on this most excellent immunohematology test. This is a fun episode! 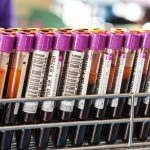 Whether you are a pure beginner or an experienced blood banker, you will come away with a much better understanding of why the DAT is so important! 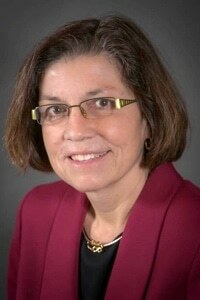 About My Guest: Sue Johnson, MSTM, MT(ASCP)SBB is the Director of Clinical Education at BloodCenter of Wisconsin (a part of Versiti). She also is the director of the Specialist in Blood Banking Program at BCW and the Transfusion Medicine Program at Marquette University. Sue is Associate Director of the Indian Immunohematology Initiative, a program designed to improve general immunohematology knowledge in South Asia. She is a sought-after speaker and world-class immunohematology expert. 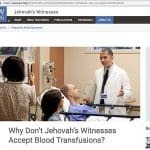 Sue also appeared on episode 050 and 051 of this podcast (in both cases, discussing Pretransfusion Testing). DISCLAIMER: The opinions expressed on this episode are those of my guest and I alone, and do not reflect those of the organizations with which either of us is affiliated. Neither Ms. Johnson nor I have any relevant financial disclosures. The images below are generously provided by Sue Johnson. The featured image seen in the podcast episode list and on Facebook and Twitter was illustrated by Jenny O’Connor, MLS(ASCP)SBBCM. I am so happy I finally came across this podcast! Well, so am I, Flavia! I’m glad it’s helpful to you. I don’t THINK so, but it’s nice of you to say. People like Sue are the superstars! what is the cause of positive DAT in patients administering IVIg? Sue mentioned this in the podcast, I believe. Intravenous Immunoglobulin is really just a “bag of antibodies” that includes a ton of different immunoglobulins. It’s incredibly common to see blood group antibodies in IVIG, and it’s also very common to see a positive DAT as a result of antibodies binding to the patient’s RBCs either specifically (antigen-antibody incompatibility such as anti-A binding to group A RBCs) and nonspecifically (general adhesion to the RBCs. 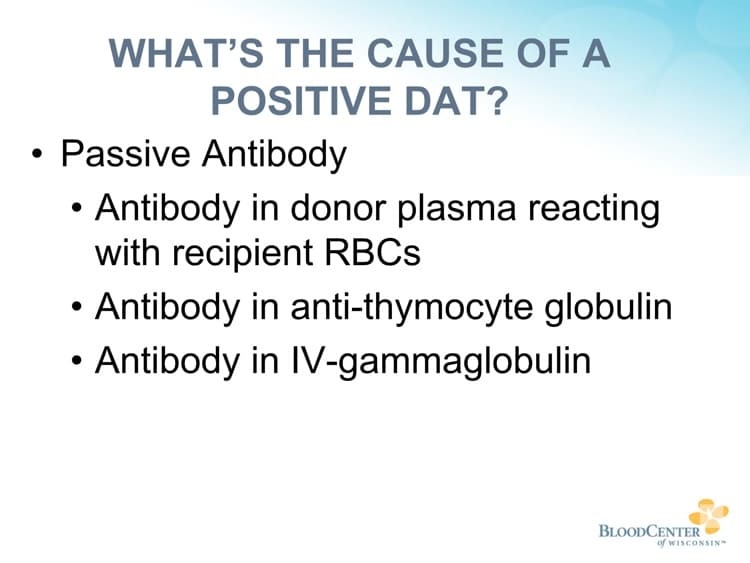 Also to be included as passive acquiring antibodies the Rh0(D) Ig injection which causes positive DAT (in HDN and ITP). Sue did mention Rh Immune Globulin injections, Ashraf, primarily in regard to pregnancy and prevention of anti-D formation. You are absolutely correct in saying that when it is given intravenously in ITP cases (to D-positive patients), we will see a positive DAT. 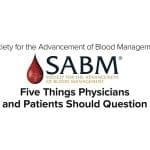 Great podcast!Just one question: When performing DAT can we use another anticoagulans which is not EDTA or heparin?For example can we use some that contains citrate? ?How that will affect the results? Thank you ? excuse me Joe I did not got the idea if column gel DAT is more sensitive or tube method is more sensitive??? The antibody in Paroxysmal Cold Hemoglobinuria (PCH) is indeed an IgG, however it is an unusual IgG, Ashraf! The antibody, an auto-anti-P, is “biphasic” in that it binds to the patient’s P-positive RBCs in colder temperatures, and then generally dissociates or hemolyzes the RBCs at warm temperatures. 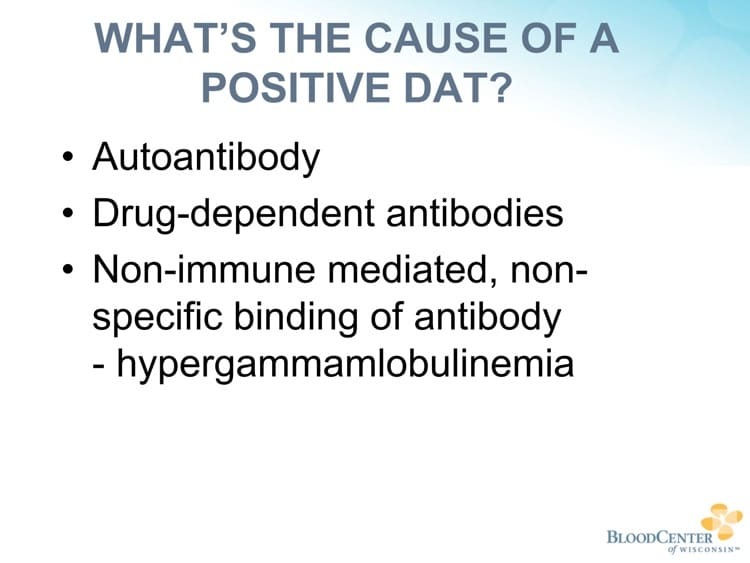 That is why the DAT is usually positive only with complement (because the antibody is dissociated at body temperatures). Kidd antibodies (anti-Jka or -Jkb most commonly), on the other hand, would usually result in the DAT being positive with anti-IgG, potentially with anti-C3 reagents as well. Big topic! 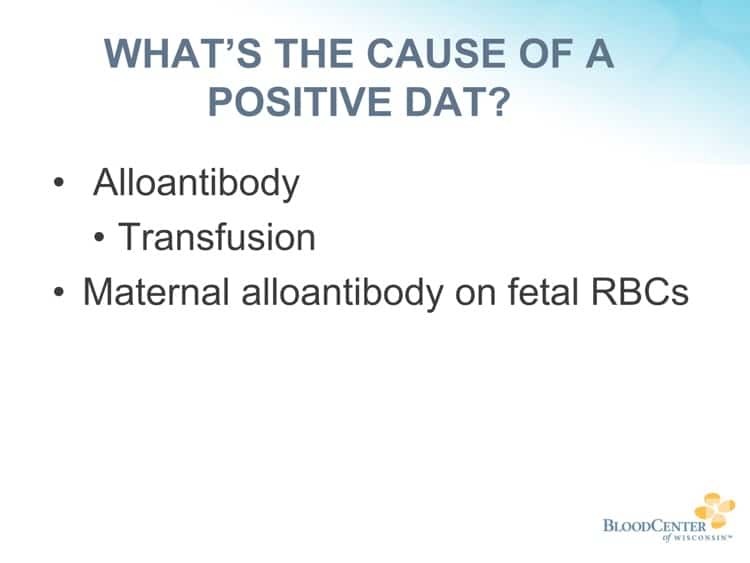 “Enhanced DAT’s” (often called other fun names like “Super Coombs”) are DATs done when there appears to be hemolysis, but the DAT is negative (DAT-negative hemolytic anemia). 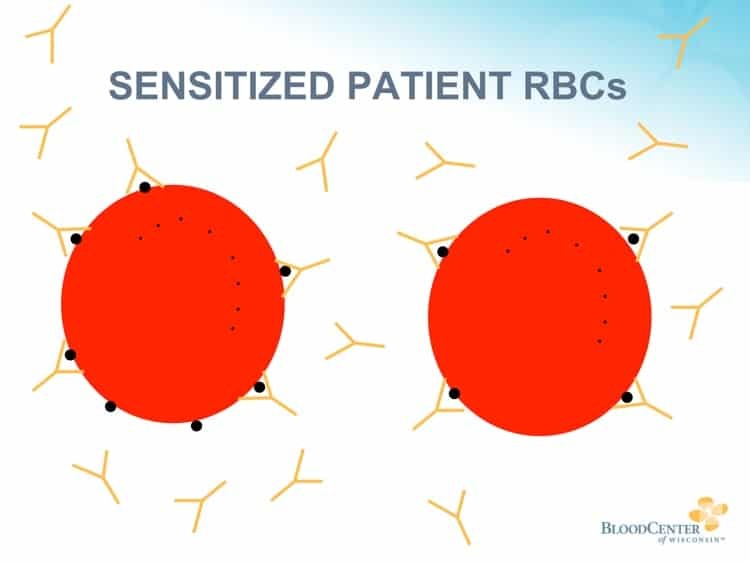 In certain cases, the antibody may be coating the RBC, but not densely enough to trigger a positive DAT (less than 100 molecules per RBC is generally the approximate sensitivity). 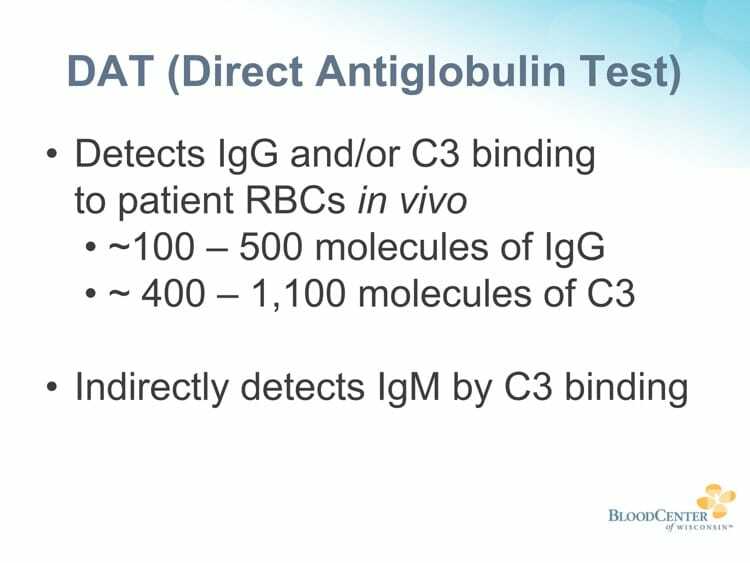 in other cases, the antibody may be IgM or IgA, and the normal DAT does not detect those antibodies (being anti-IgG). So, certain labs perform enhanced analysis, including methods to detect lower quantities of IgG, as well as methods to detect non-IgG antibodies coating the RBCs. I JUST STARTED LISTENING TO YOUR PODCASTS. I AM REALLY ENJOYING IT AND STARTED STUDYING FOR SBB. I AM MORE VISUAL AND AUDIO LEARNER SO I AM GLAD I GOT YOUR SITE. I REALLY APPRECIATE THE WORK YOU ARE DOING. IT IS HELPING ME A LOT. THANKS FOR EXPLAINING ENHANCED DAT WHICH I DIDN’T HEAR IT BEFORE. Hi, i understand even a 1% of donors could have a positive DAT and be perfectly normall healthy donors, but my question is, this red cells could have any secondary effects for the pacient that receive the blood?? or can they have a short life in the pacient beacause they are coated?? or is completely safe for the pacitent? That is a great and important question Diana! The answer is: If we know the donor has a positive DAT, we generally do not use the blood. 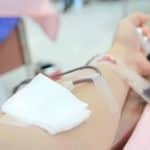 Positive donor DATs interfere with serologic compatibility testing (in particular, the anti-human globulin crossmatch will be falsely positive), and sure, the RBCs could be cleared from the circulation faster, so they are generally discarded, not transfused. Thanks for asking! Thank you, is it possible that you can give me some recommended reading about it??? I have been giving blood for many years-too many to count-and have had a positive DAT for probably 15 years. There have been a few times over the years where it did not show. However, most of my donations recently have been declined. 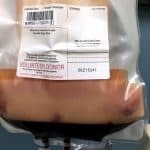 I have been sent a notification letter several weeks after the donation saying that I had the positive DAT and they would not be able to use my blood. I have had tests done and there is nothing wrong. I guess I will have to stop donating. Is there some treatment to resolve the positive DAT? Only your doctor can tell you that for sure, Richard. Most positive DAT’s are completely benign, and since we often don’t know why they are there, there isn’t really any treatment. I’m sorry to hear that someone who has been so faithful will not be able to donate anymore! 1) the AHG or AntiComplement reagents (not their targets— but the actual reagents— the green stuff— are composed of IgM? Or IgG? 2) And I didn’t get why you would use an anticonmplement to id cells sensitized with IgM – I thought IgM was a ‘direct agglutinate’ and it’s presence would be detected in just spinning w/o the AHG? Are we talking about if it was a very low amount of IgM and not enough to yield a macroscopic clump? 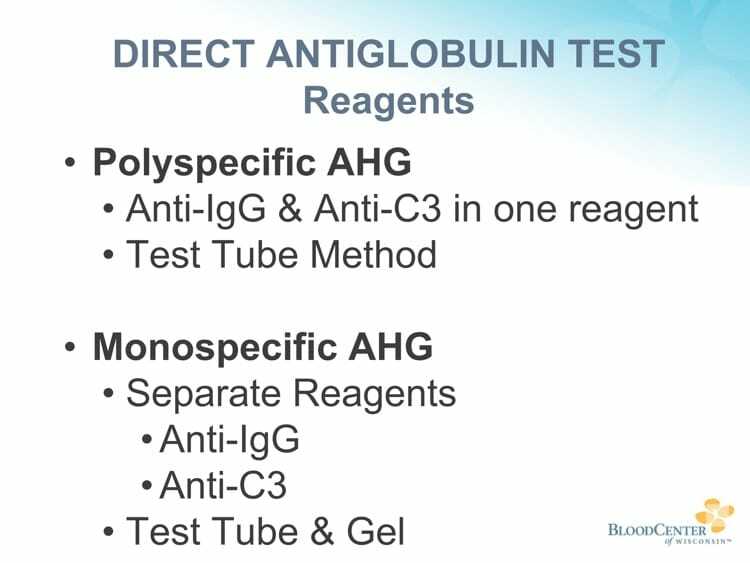 3) And is the reason the anti CD3 would be used and not the AHG for IgM prescient because the IgM Fc portion is hidden because of its petamer structure? So the AHG wouldn’t detect IgM? (I”m assuming the AHGs target is the Fc— is it some other portion of the molecule that is still unique to IgM ? Varies based on manufacturer. Mostly really strong IgG, though IgM monoclonal reagents are common for anti-complement AHG. IgM antibodies are often “cold reactive” and dissociate from the RBC at body temperature, so the complement may be all that’s left. See answer 2 (it’s primarily because the IgM is long gone and the complement is all that’s left on the RBC). is this phenomenon of disassociating at body temp due to some disassociaton constant related to all those non covalent bonds (mentioned in protein chem but …promptly forgotten by me–but Vanderwall? rings a bell) is different for IgM vs IgG? or is actual sterochem of the CDRs on the Fab region of Ab of IgM doest change based on temp does it? The details are beyond what I normally cover on this site, Annette, but it has to do with endothermic and exothermic reactions of antibodies vs protein-rich and carbohydrate-rich antigens. 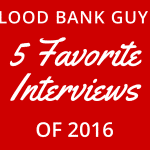 I covered this in a “BBGuy 5 in 10” session I did on Facebook on February 2, 2017 (you can find the video on facebook.com/bloodbankguy; it was question 5 of the video, so scroll ahead!). I hope that helps! hi, joe.a wonderful and comprehensive explaination! thanks for clearing my doubts. I do not understand how does IAT can be used to diagnose Paroxysmal Cold Hemoglobinuria, which is caused by an unusual Ig G.
I thought IAT can be used to detect only Ig M as it uses anti- human Ig which targets only Ig M? please enlighten and correct my misconception.thank you! Sorry I missed this, Susan. The IAT is only useful in the diagnosis of PCH in that it may show positivity with anti-C3 reagent. It would not react with IgG usually, because the IgG antibody dissociates at body temperatures. PCH is diagnosed in the lab with the Donath-Landsteiner test, which you can find out more about with a simple Google search (I don’t have anything here on it yet). You appear to have a little misconception in that the DAT generally does NOT detect IgM directly. 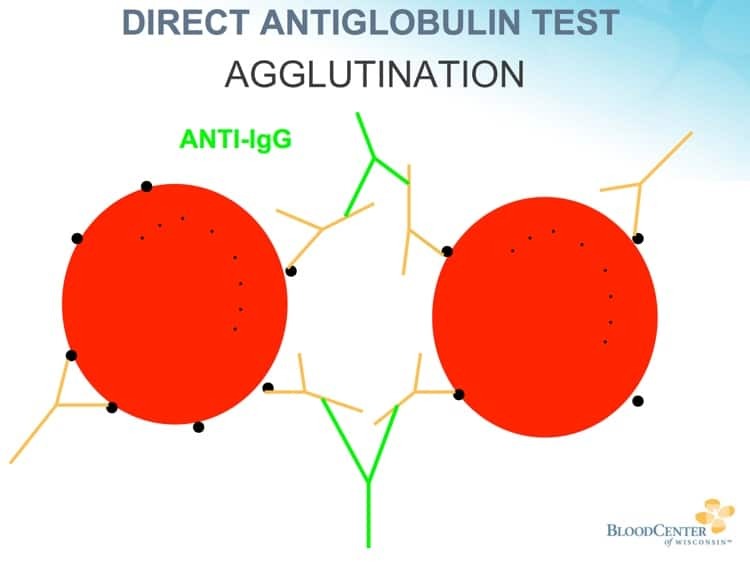 The anti-human globulin you referred to is, in the US, targeted toward IgG or complement (C3, specifically). There are anti-IgM reagents, but they aren’t in routine use in the US. hi, Joe , EDTA impedes complement activation since it chelates Ca, how it is the sample of choice here??? Ashraf, it’s a trade-off. Using EDTA plasma samples could potentially impact weakly-reacting, complement-dependent antibodies (the ones of most impact are in the Kidd system). However, this is not a common problem. On the other hand, using serum (clotted) samples can easily give you false positive reactions due to in-vitro, nonspecific complement activation on the RBC surface. 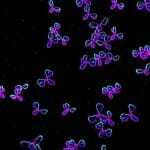 Generally, the false positives are considered more of a potential problem than the rare false negatives seen due to a very weak complement-dependent antibody. 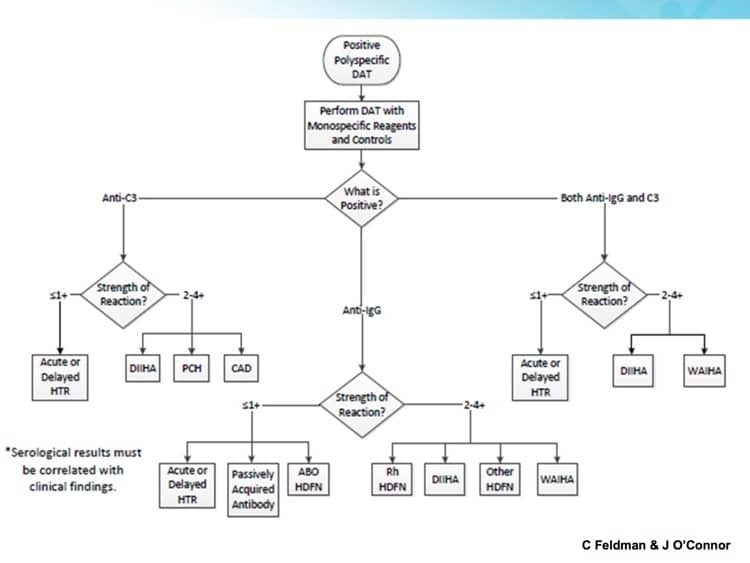 Hello Joe, does kidd antibodies or others will give positive reaction with both IgG monospecific as well as positive reaction with complement monospecific? So, reading back what I wrote previously, there is one very specific problem: I neglected the fact that you were talking about the DAT! My apologies. 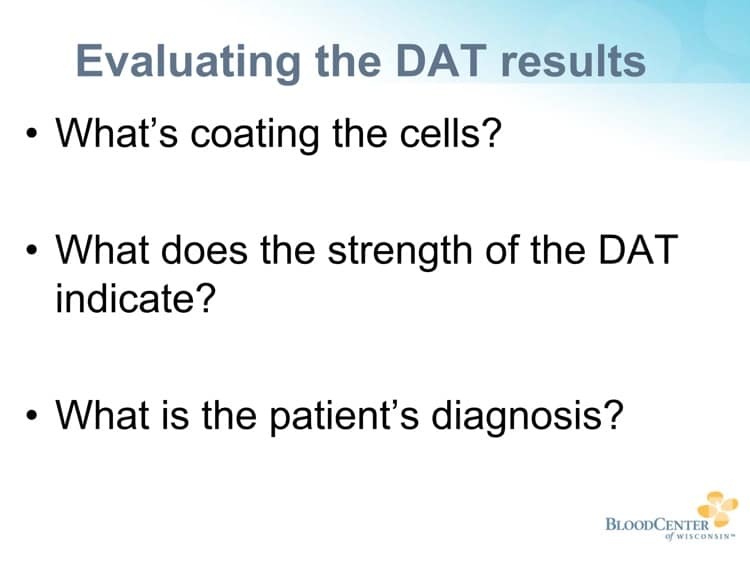 So, remember, with a DAT, the antibody is already stuck on the RBC in the body, not in the test tube, so the use of EDTA for the DAT should not really impact the DAT for those antibodies that are weakly reacting and need complement (like some Kidd examples). In answer to THIS question, most alloantibodies give reactions with anti-IgG when there is antibody-RBC interaction. A few, like some Kidd antibodies, give both anti-IgG and anti-complement reagents, but most are only anti-IgG. Hi Joe, so we can say that EDTA samples will prevent invitro activation of the complement, and what is left RBC in which complement and/or IgG attached to their membranes, and thus it is the best anticoagulant for DAT, can we say that? I think that’s a reasonable statement. Excellent!!! I listened twice. Thanks so much for making me “Immunohematology” smarter EVERY DAY. As a BB/TM fellow I need as much concise and efficient or practical information as possible! I love your pocasts and always puts a smile on my face! Hi Joe H hope you are well. Is platelets carry ABO antigens on their surfaces??? 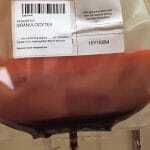 If yes, should we respect them or not in transfusion practice. Hello Joe, Now we know that PLT carry ABO antigens, should we respect this in platelet concentrate transfusions?? and thus we should give ABO compatible PLT concentrates? Second Q please, now we mix 4 or more PLT concentrates does also we have to respect their ABO type???? Ashraf, your questions don’t really apply to this post, so I’ll be very brief. While ABO-identical platelets are best, most will transfuse platelets without regard to ABO in times of urgent need or short supply. The same applies to your second question. The blood bank where I work uses gel technology to do DAT. Poly gel cards and IgG gel cards are available from manufacturer, but not C3 cards. So we never do a monospecific C3. I wondered how other facilities handle this. In my work we use polyspecific gel cards to perform the DAT (IgG and C3d). I was wondering if it is also possible to use our IAT card (anti-IgG plus anti-light chains) to perform the DAT? How do you perfom an enhanced DAT? We use LISS everytime we make a red cell suspension for our DATs. Is this a kind of enhanced DAT as well? Sue says in the podcast that the only (?) way to find IgM in the DAT is by using an anti-C3d ’cause complement is often atacched to IgM (indirect way). But what about these gel cards used to perform monospecific DAT? They have anti-IgG, anti-IgA, anti-IgM and anti-C3d in separated wells. So happy to hear you found the podcast useful and most importantly you learned something! You should be fine using the IAT card (anti-IgG plus anti-light chains) to perform the DAT, however we don’t have that available in the USA and I haven’t read the manufacturers directions. 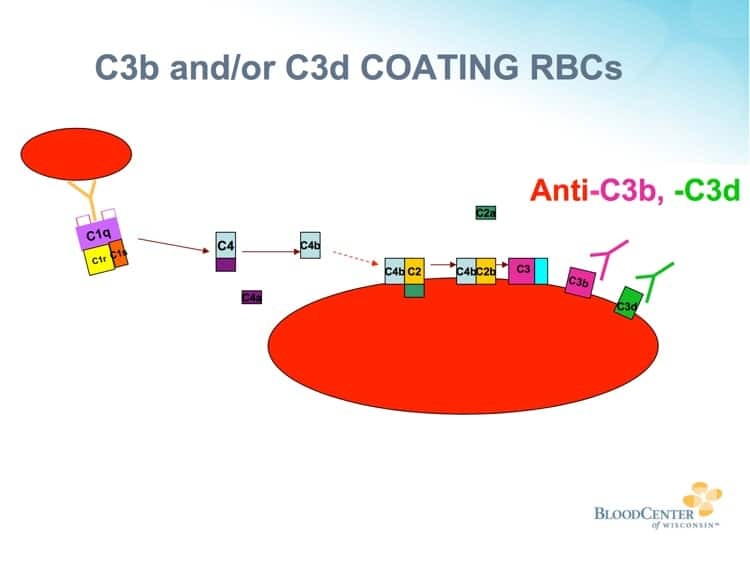 The anti-light chains may show some cross-reactivity (false positive) if an individual also had IgM or IgA coating their RBCs. I have only seen this a few times in my career and in both cases the individual had very strong IgM cold autoantibody. Speaking of not being available in the USA we do not have licensed anti-IgA and anti-IgM available here either. You’re lucky! I should have said, if you have these gel cards available you are able to detect IgA and IgM directly. My apologies for being country specific… it is so awesome that people from all over the world listen to these podcasts!! I understand performing a DAT in gel includes diluting the RBCs in a LISS diluent but these standard Gel DATs do not serve as an enhanced method. When I talked about LISS, I was referring to washing the RBCs using a 4C LISS wash solution. On top of it, we perform the washing in the walk-in refrigerator. This is to help keep low affinity IgG attached to the RBCs. My friend Sue is just showing off now! Seriously, she’s brilliant AND nice enough to answer questions on the site? You’re awesome, Sue! Marion, thanks so much for the kind words! 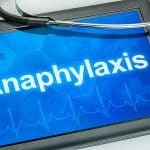 Hi Joe, just found your site, and I love it. I am a former bloodbanker, now pediatrician. I left the field prior to the introduction of gel typing. So here are my 2 questions: my hospital uses tilt tube DAT testing (but NO microscopic read). I have noticed that many of our babies with ABO HDN have negative DAT test results when performed in our lab, but if sent out to a gel testing lab, those DATs are positive. #1 why do blood bankers no longer perform microscopic reads of DATs #2 is gel DAT superior to tilt tube DAT in terms of sensitivity, especially if microscopic reads are not performed? It’s great to have pediatrician’s with blood banking background! You are asking several interesting questions. 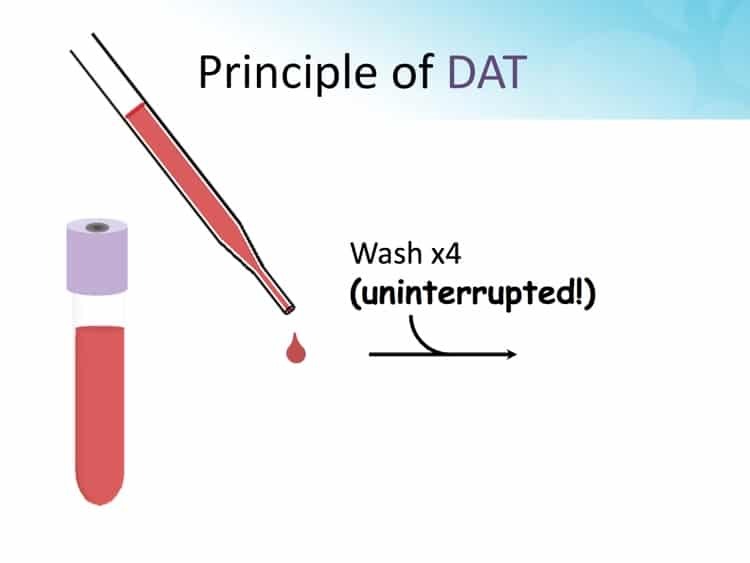 #1 A DAT performed in a test tube continues to be the routine method performed by laboratories who perform antibody identification in test tubes and who utilize solid phase methods for antibody detection. Many laboratories using test tube methods in general have eliminated the microscopic reading with the belief, and I do believe myself, that well trained medical laboratory scientists do not need the microscope to detect weak agglutination. I personally have observed that the microscope becomes a crutch and the laboratory scientist becomes to vigorous in shaking or tilting the test tubes. It then becomes a training issue rather than a test sensitivity issue. #2 My opinion, gel DATs are not superior/more sensitive to tube DATs. We have included gel DATs in our DAT negative hemolytic anemia evaluations for years. While there are some gel DATs that may be positive, it is clearly not a routine finding showing superiority over test tube or other methods. There are two reports on these evaluations both in the journal Immunohematology. My thought again is it comes down to how you shake/tilt and interpret the results. Sorry for the long answer! You CAN use clotted samples, but non-clotted (EDTA) samples are preferred. 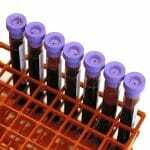 The issue is not false negatives; using a clotted sample is more likely to cause false positives due to nonspecific complement fixation to the surface of the RBC in a clotted test tube. Hi Joe, and thank you for a great podcast. Enjoy it tremendously! I listen to it every day wile I commute to work. I`m wondering if You can explain why, when we have a positive DAT with IgG, we still can have negative auto control on identification panel done with IAT ,(the same patient and same sample). I just cant get my brain around it. My other question is , haw do you know that C3d positive DAT is caused by IgM. Some of the IgG classes also may activate complement. Katta, the answer to your first question is that these are biologic systems, and testing just doesn’t always follow the rules! I agree with you that it’s reasonable to expect someone with a positive DAT with anti-IgG to have a positive autocontrol, but the reagents used may not be the same, the conditions may not have been the same, the platform and/or reagents may have variations, etc. For your second question, the answer is: You DON’T know for sure! However IgM as a complement-fixer rather than IgG is just playing the odds; it just happens way more often that way. Sure, some IgG’s can fix complement, but generally not as efficiently as IgM. Also, if IgG was fixing the complement, you’d usually expect to see positives with anti-IgG antihuman globulin, too! Hello dr Joe! I have watched basic Imunohematologic video series using the link below the podcast. In video 5. where dr. Sue explains The Antibody detection test, I see that the incubation time for reaction mix of patient’s serum and test cells is 30 minutes without using potentiator. In our facility, we are performing all tests in tubes. Manufacturer’s instructions on the antihuman globulin serum that we are using says that IAT is supposed to be performed with incubation time of 15 minutes, without any potentiator. My question is: should we follow their instructions completely and incubate it 15 minutes? I am afraid that the recommended incubation time of 15 min. without any potentiator is too short… Is it a problem if we extend it to 30 minutes? What are your thoughts?